Still settling on just the right New Year’s resolutions for a happy and healthy 2019? Maybe this is the year to forget the unrealistic self-improvement goals and focus on someone else. Making some New Year’s resolutions focused on your dog can be a far more effective way to reaching those lofty goals of becoming more fit, relaxed and organised. If your dog could pick your New Year’s resolutions, she’d have some great ideas. Of course, some of her suggestions would have to be vetoed. It really would not be a good idea to make her a steak every day or never take her to the vet. But what else would she suggest? Your dog’s very favourite thing (aside from steak) is quality time with you. So that is what she’d focus on making your New Year’s resolutions. If your dog is hyper around the house, barking at every noise and destroying things, she probably isn’t getting enough exercise. A daily walk will improve your cardiovascular health and bone strength. It’s great for your mental wellbeing too. A brisk stroll every day can boost your mood and cut your stress. One study done in Japan in 2015 even showed that it can improve your short term memory! Walking is a great way to improve your health and keep your dog happy and healthy too. It will burn up some of her energy and keep her mind active so when she gets home, she will find it easier to relax quietly and not destroy your things out of boredom. A brisk walk every day will add quality and quantity to both of your lives. Best of all, it costs nothing. You don’t need special equipment, just comfortable shoes and weather-appropriate clothing, and you can do it almost anywhere. Go with friends to make it social, or enjoy the solitude of just you and your best friend walking together peacefully. You can walk in the city, around a suburban estate, in a park or out in the countryside. (Just stay off of farms and make sure you are visible after dark for safety.) How far and how fast you go is up to you. If you have not been physically active for a while, start slow and gradually increase your speed and distance. 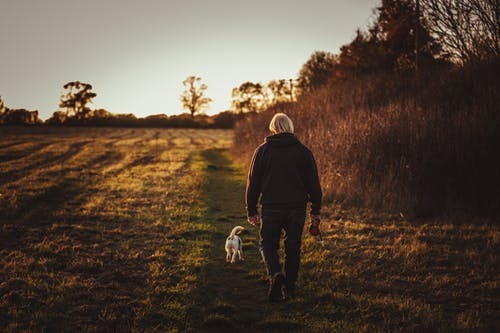 If you are walking daily now, ask yourself what walking more – either further or more often – would do for you and your dog. While you can mix it up and walk whenever you can fit it into your schedule, your dog will love having a regular routine so she knows when it is time to walk. Going walking at the same time every day is also a good way to make it a regular habit. Okay, your dog might not be quick to suggest this, but she will appreciate it in the long run! Not all breeds need a daily brushing, but it is a nice way to relax together. It also means you spend less time cleaning dog hair off everything. Brushing stimulates the blood flow near the skin. Your dog’s skin produces oils, and brushing spreads them through the fur, keeping it soft and shiny. It also prevents matts. Do it right, and it is like a massage for your dog. It’s also a great way for you to relax and unwind. Dental care is not really anyone’s idea of a good time. But taking time to brush your dog’s teeth and giving her Leader Oral Pro dog treats daily can prevent real problems. You can buy a special dog toothbrush and toothpaste. Above all, never use toothpaste for people on your dog! Start slowly and gently, and be sure to give your dog a treat when you finish to teach her not to dread tooth brushing time. Just like us, dogs like to learn new things, be useful and earn praise. Whether she is a pup or a senior, your dog can enjoy learning new things. It keeps her mind active, and that keeps her happy. Dog tricks range from those that are just fun and funny to those that are practical and helpful. 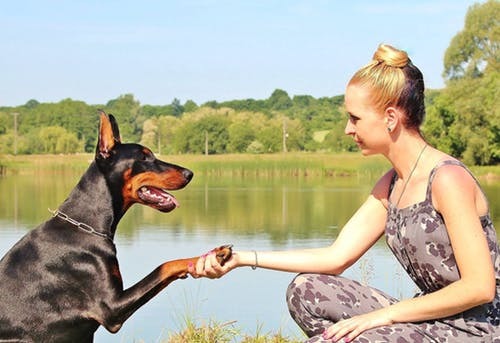 Start with a simple trick like shaking hands and see how pleased with herself your dog is. You can teach her to do classic things such as fetch your slippers or even get started with some agility training for a real challenge. Whatever you want to teach your dog, the key is to consistently reward her for doing it. Praise her lavishly, and reward her with a treat. Do choose the treats carefully because dog training takes a lot of repetition and you’ll be giving her a lot of them. Look for ones with healthy ingredients and fewer calories, such as Leader Train Me treats. Many of us make New Year’s resolutions to eat better. So why not do the same for our dogs? It is so easy to succumb to those pleading eyes and feed her things you know she really should not have. This is also a good time to assess what type of dog food you feed her. Is it still appropriate for her age and activity level? Or is it time to transition her to a food specially formulated for senior dogs such as Leader Adult Senior? If you got a puppy last year, is it time to make the move to regular adult food? Dogs have different nutritional needs at different times in their lives, just like humans do. Puppies have endless energy and their bodies are growing, so they need a food rich in nutrients with calories to fuel them. Older dogs are less active and at risk of becoming obese. A senior food will help prevent that as well as giving the nutritional support she needs to stay comfortable as she ages. It is easy to forget your own New Year’s resolutions by March, but if you involve your dog, you are more likely to stick to them. Spending time with our dogs is actually good for our own health. Dog ownership offers some solid benefits for our physical and mental health. Making some New Year’s resolutions to walk your dog more and spend more time together is a fun way to make yourself exercise and unwind without the pressure of unrealistic goals.